This past several days, I’ve been engaged in polishing up the forest background. The forest background that shipped with 1.0 was unsatisfactory to me; many elements of it were barely better than sketches, and the far-distant portion of it was a boring monochrome. However, we shipped with it because it didn’t affect gameplay, only aesthetics, and we believe in RERO (release early, release often). Probably after our upcoming update, I am looking into doing some major additions to those interactible/standable trees, adding a much larger variety of branch elements, and if I have time, perhaps even adding some variants on the tree trunks (wider, thinner ones). I’m also planning to flesh out the foliage tiles a bit. I’m well aware in writing this that I haven’t written that primer post I’ve been meaning to write describing what MTPs are. I’m going to try and pretend I’ve done so already so as not to clog up this post, and will fix that retroactively. To sum it up, though a “multi-tile-pattern” lets you define a tile pattern that’s drawn across more than just one 16×16 tile. It allows us to draw elaborate set pieces that will be put onto a level if the underlying tiles are laid out a certain exact way. For example, it’s what allows us to draw the “obviously larger than one tile” corners of the house interiors. Remember – everything in frogatto is auto-tiled, so this means those large set-pieces will just “appear” if you arrange the tiles the right way. One thing we’re working on for Frogatto is “arcade style” levels. Arcade style levels will be never-ending levels that are randomly generated, and which have making a high score an objective. We’re hoping this will allow for a fun alternative way to play the game. The yellow segment in this screenshot is the currently selected segment, and then the red segments are all segments which can go directly after the selected segment. Then, Frogatto Formula Language commands are available which allow the level to order the segments randomly, making sure that one segment only follows another where appropriate. Of course, in some cases we might need to augment this basic logic with a little more sophistication: making the game get harder as the player goes further, for instance. But this can always be done by adding FFL to the level. 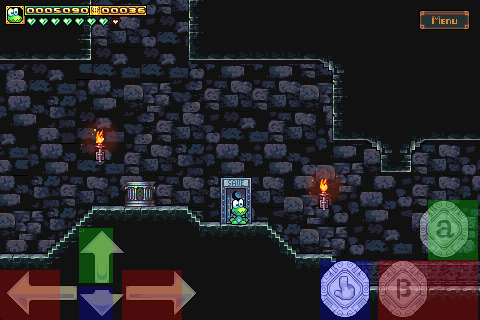 Hopefully with this system in place we’ll be seeing some fun arcade style levels in future versions of Frogatto. Frogatto is only $0.99 in the App Store for 3 days! Now that 1.0.1 is out, and all significant technical problems should be fixed, we’re really trying to get the word out! The sale ends when Apple decides it’s the 11th (which might be at about 11PM EST on the 10th). Since Frogatto started selling on the App Store, we’ve had mostly really positive feedback (which has been great! ), but there’s also been a lot of complaints about the controls; ranging from “needs some work” all the way to “horrible!”. At first our reaction was along the lines of “well that’s too bad, but there’s not a whole lot we can do about it…”. A few days later though, I was looking at the code, and discovered that the active areas for the controls were not at all what we thought they were. One person said it seemed like we hadn’t even tried the game before submitting it to the App Store, but in fact, the opposite is true: we tested it so much that we all got used to it and thought it was fine. Another person said that it seemed like we got lazy near the end of development, which is almost true, but not quite – we didn’t get lazy, we just rushed it a bit. It had been over 2 years, and we just really wanted to get the game out there. We fully intended to release updates after 1.0 though, and that’s what we’ve done; last Friday (July 29th) we submitted a minor update, 1.0.1, which Apple will hopefully approve soon. As you can see, the active areas in 1.0.1 are much bigger, which should make them a whole lot easier to use. The water controls have also been improved a lot. They look the same, but the active area of the circle is now 2.4x the size of the circle you see, and once you put your thumb down inside it, it will work until you lift it up again, no matter where you move it to (suggested by howiedeano on the Touch Arcade forum). Besides the controls, a lot of people complained about lack of auto-saving. We did actually make auto-saving (we agree, it’s important! ), but none of us have a device new enough to support iOS4’s multi-tasking, and it turns out it didn’t work with multi-tasking. This should be fixed in 1.0.1 as well (by simply disabling multi-tasking for Frogatto), along with a bunch of other less significant bugs. Hopefully this will fix all the significant technical issues, and we can get back to improving the rest of the game! Update (08/06/2010): 1.0.1 is on the App Store now!